Nigerian Prophet T.B. Joshua has released an official video of his famed 'Zimbabwe Coup' prophecy to Emmanuel TV's YouTube Channel. "I am seeing military - they are interested in embarrassing a President," Joshua is heard saying in the clip dated Sunday 31st August 2014. "They are still on in that plan - to kidnap either a President, Vice President or First Lady of that nation," the cleric continued, specifying that prayers should be offered for Southern Africa. "They want to kidnap him and if he refuses, they will kill him… God showed me the place but I don't want to put any country into pandemonium." Online reactions to Joshua's prophecy have been varied, with some hailing the cleric, others denouncing the prediction as a 'lucky guess' and still more suspecting the cleric had 'inside information' on the military's plans. "I'm waking up to a world where a TB Joshua prophecy has come true. Kill me now," wrote CynicHarare on Twitter, a notable critic of Joshua on social media. Zimbabwean media mogul Trevor Ncube acknowledged Joshua's proclamation. 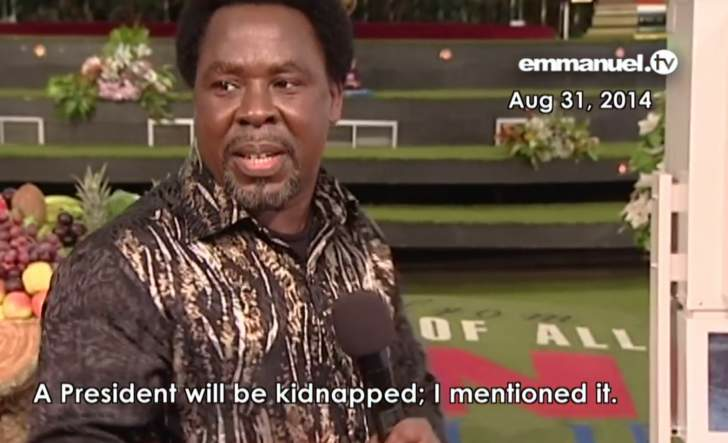 "Yes, I saw that prophecy from TB Joshua," he told a follower on Twitter. "What a true prophecy!" Former Nigerian Minister of Aviation, Femi Fani Kayode and popular comedian AY also shared Joshua's prediction on their social media platforms. "This prophet is sharp in the spirit; even a plot was shown to him three years ago," wrote one of Joshua's followers on YouTube. The situation in Zimbabwe remains tense with reports stating Mugabe, currently under house arrest, is refusing to co-operate with the military's insistence that he relinquish power and hand over to his former Vice President Emmerson Mnangagwa.